Listen people, I can't make this stuff up. If you don't believe me, I'll make sure to put the link at the end of the article to the Google Webmaster Blog Article. Google released this SEO, search engine optimization, cheat sheet back on March 14th so I am sorry it's coming late. I hadn't looked over there this month and fortunately for me, I did. It is EXTREMELY BASIC and has very little information that an SEO novice can benefit from. It can however be used as a tool to inform bosses, managers, and your cloistered peers revealing some basic insight into search engine optimization. 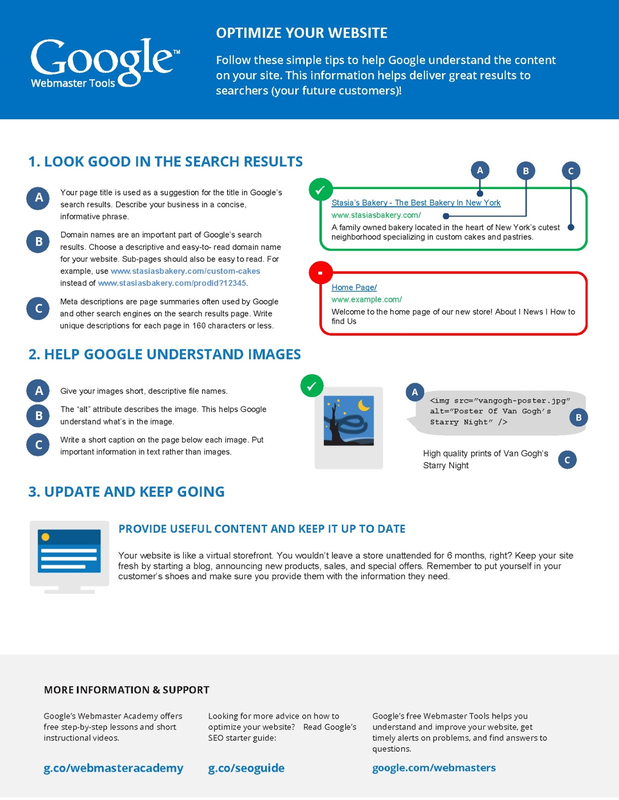 If you can't view images from your mobile device or your browser here is a quick recap of the search engine optimization cheat sheet. Your page title is used as a suggestion for the title in Google’s search results. Describe your business in a concise, informative phrase. Domain names are an important part of Google’s search results. Choose a descriptive and easy-to- read domain name for your website. Sub-pages should also be easy to read. For example, use www.stasiasbakery.com/custom-cakes instead of www.stasiasbakery.com/prodid?12345. Meta descriptions are page summaries often used by Google and other search engines on the search results page. Write unique descriptions for each page in 160 characters or less. Give your images short, descriptive file names. The “alt” attribute describes the image. This helps Google understand what’s in the image. Write a short caption on the page below each image. Put important information in text rather than images. So there you have it - loads of SEO information to keep you satisfied and possibly help you explain some basics to higher ups or even noobs. :) We were all noobs at one point and it is a large. ever changing, learning curve. Good luck and keep optimizing! It's great that you mentioned image file names - it seems like no one ever really talks about them and everyone mostly focuses on alt tags. Image file names have a huge impact on not just the SEO of the pages the image is on, but on the SEO of the image itself in image searches. You must never over stuff a web page with your keywords, otherwise you might risk getting banned by the search engines. Many SEO experts warn about using too much of the keywords on any website or web page. If you spread your resources too thin, you will fail. I have written some code to calculate the number of rolls of wallpaper to decorate a room. I have compiled it and at first it worked OK, using it in my C compiler program (LCC Wedit). Subsequently I tried running it by clicking on the executable and it does not run and returns code -1 instead of 0. Even if I return to the compiler program it comes up with the same return code. Today you may find heaps of information and offers on increasing web traffic by using various software, systems, tips, manual web 2.0 creation techniques and resorting to SEO companies' services. However, if you really want to find the ways to valid and complete web traffic solutions, consider the following. PDF books are virtual niche backlinks set in the portable document format. Anyone who wants to read the pdf book should have adobe acrobat reader to read such books. It is a universally accepted file format. This article is very informative and well explained. Thank you so much.